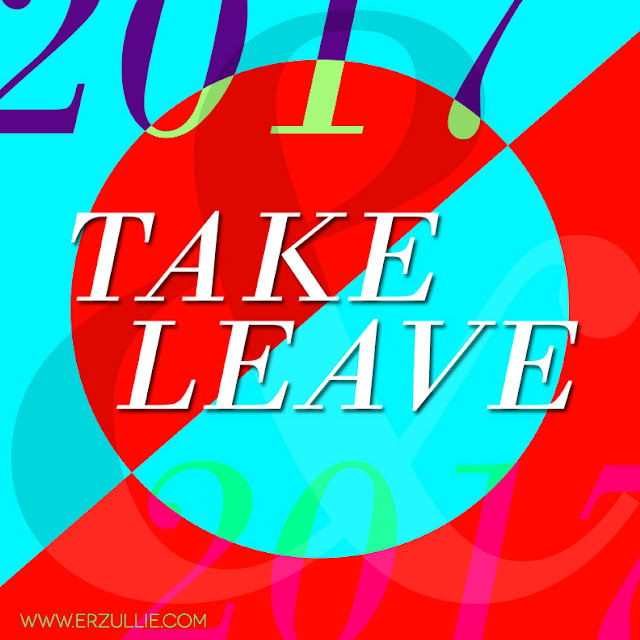 The year is about to end, and of course, what would it be without our usual TAKE AND LEAVE list for 2017? Yep. I said it. I was a perennial overthinker. Some time I think too much to the point that I get stuck there. I get caged and guess what happens? NOTHING. It's just an endless cycle of torture and weirdness and the sad part is you get tricked that you are solving a problem --- but truth is you are not. YOU ARE JUST IN THE PROBLEM... not getting out of it. So yeah, overthinking. YOU STAY IN 2017. NO MORE. They say that a little ego is good for the soul, but I think they confuse it at times with assertion of self-worth. Ego for me is the image that I make up for myself, while self-worth is simply the value that I already have right now way before I even recognize it. My ego has been torturing me since the dawn of my existence and I am very happy to know that this year, it has died or at least I am able to identify it. That way, I know which one is really me and which one should really have to go. I love a good plan, but it becomes a bad one when I am punishing myself unnecessarily for not being able to manifest it at the moment I said so. So, no more plans. Just dreams and goals and me trusting in the intelligence of the cosmos on when and how it should happy. I have been wanting to write this down for quite some time, but ladies, I have realized that it was only this year that I was able to learn to actually love my own company. I know that I go on self-dates and all that jazz, but that moment in Recession coffee will change my life. I vow to always remember that moment because I can honestly say at that point, I do not want to be anywhere else in the world and be with anyone else too than in that cafe and with me. My connection with my heart is stronger. I can hear her voice loud and clear now. I am very happy to announce that I am constantly asking my heart what makes it sing and follow that direction no matter what. Life is all about what makes your heart sing. I will explain this further soon. But let's just say that I was able to discover how to just relax and open up like a flower and allow the Universe to just take care of me.